As the most math-phobic knitter on the damn planet I have to say that I am blown away by the acumen for knitting arithmetic displayed in Amy Herzog's brand-new Knit to Flatter. You guys, she has gotten her abacus and tape measure out and breaks it down for you in this book! 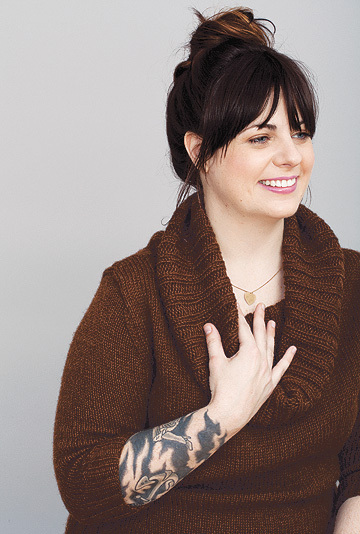 If you know anything about Amy, you know that she one of the most passionate knitters and designers you will ever meet. Her absolute love for the craft as well as meticulous attention to fit shine through in this book. That someone would take the time and research a series of precepts and modifications that will help other knitters knit sweaters that will fit them perfectly is really quite amazing. I mean, I'm such a selfish knitter that if I were going to try to figure the whole body proportion thing I would just do it for myself and just leave the rest of you lot to work it out on your own. But Amy didn't do that! She's nice like that! 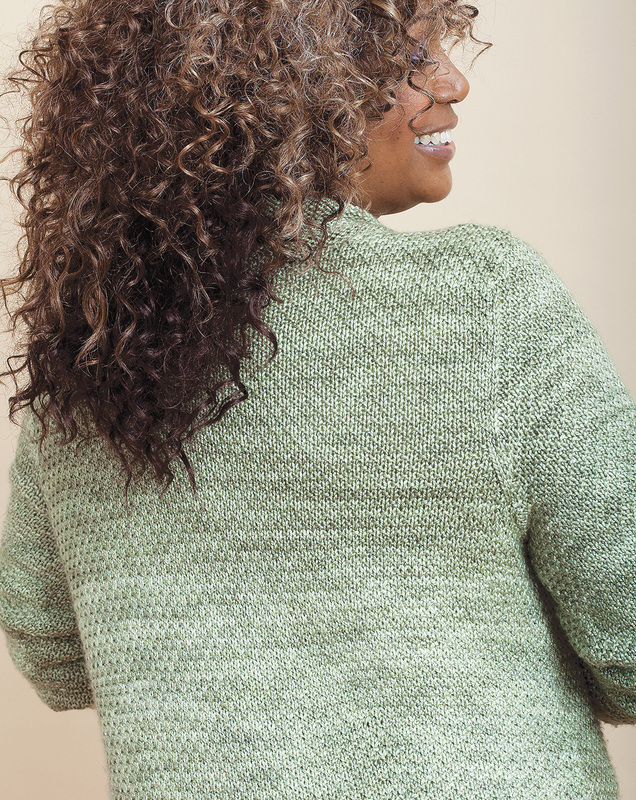 Knit to Flatter contains page after page of absolutely luscious sweaters. You know that thing where you buy a knitting book and there are maybe like 2/20 of the sweaters that you might actually wear? Yeah that's not the case here. You are basically getting this book and then wanting to knit almost everything in it. That being said, I have narrowed it down to two that will be MINE ALL MINE once I check out of Hatville (more updates coming soon, I promise!). First up for me will definitely be Delish Cardigan. Delish, right? Everything about this cardigan is so appealing to me: the stitch pattern, the plain hem + narrow v-neck, the open cardigan design--I love all of it. Of course the fact that the sweater pictured is done in Hand Maiden Lady Godiva isn't hurting anything either. This is a sweater I can see making and wearing. I am also extremely drawn to Stoker because ZOMG comfy cowl alert! I hope you can see the perfection that is this sweater. I am obsessed with the simplicity of this sweater. It's a stockinette cowl-,but with expert shaping. And it fits perfectly. This pattern is pictured in Valley Yarns Stockbridge which an alpaca wool blend that has a nice price AND is soft as all get out. There is no doubt in mind that you are bound to fall in love with more than a few of these sweaters and the techniques that bring them into being. As luck would have it, I have a copy of Knit to Flatter to give away, so just leave a comment below indicating your interest and I will use my random number generator (i.e. I my cat Tippecanoe points to a piece of paper with your name on it), and I'll send it off straight away! I'll close the whole thing down by Weds., so you best hurry! I would love to get really good at waist and bust shaping. This sounds like an excellent book. I have been excited about this book ever since I heard it was coming. Having taken a class with Amy, I know just how helpful and thorough she is. And it's so empowering to know that you can have a garment that fits YOU perfectly. A friend of mine bought this almost as soon as it came out, and so I got a peak at it, which was just enough time for me to fall in love with it! Thanks for the chance to win this book! I really hope I win this book. It sounds so useful! I love Stoker, too. The book would be a great addition to my library. I love the sweaters especially the cardigans. I need to know more about adjusting the pattern to my measurements. I'd love to learn how to knit sweaters that actually flattered my shape. I think this book could teach me! I would like to learn more about the sweaters lengths. I am very excited to hear more news of Hatville and delighted at the idea of a book that really deals with FIT! Love your posts. Thanks for the review (and a chance to win). Looks like this will be another good book to add to my library. I'm math-phobic too, so I feel your pain, LOL. This book is on my wish list already! Count me in, it looks like a terrific book. Me me me! I want the book Tippi! Looks like a lovely book! Thank you for the giveaway and the review! Those are always so helpful. Now this is a book I can use! Thanks for a chance. Oh pick me!! I love knitting from Amy's patterns and I've wanted this book since before it came out. However, my current attempts to be a responsible adult mean I'm not allowed to buy it,yet and my birthday is soooo far away, it feels like I'll never get this darn thing in my hands. I'm all about knitting sweaters lately. Would LOVE to add a few of these to my queue and the book to my library. Thanks for the review and the chance to win. Awesome! Throw my name in the bowl, please. Ooo, I'd love to win this. I'm at that point in my knitting where I need to learn more about fit. You made me want to go to ravelry and look at all the sweater designs. Would love this book! Oh, Tippecanoe pick me, pick me! Must add this book to my library! Ooh, I would love to win a copy, it might be the kick I need to finally knit myself a sweater! I love your feline random number generator! I am soooooo looking forward to reading and using this book! Thanks for a chance at it. I have my copy right next to me, so I'm just here to eff up the randomness. I totes love Stoker, too. This looks like a fabulous book. The more I read about it the higher it gets on my wish list. Everyone is raving about this book! Thanks for the opportunity to win a copy. ZOMG I want this book!! So glad you're posting again! Your projects are always inspiring. I would love this book - it sounds like there's so much great information. Thanks for the giveaway! This book looks like such a great resource. I would love to have a copy. Would love to add this book to my reference library! I've enjoyed borrowing this from the library and would love to have my own copy! Thanks for the chance to win. Would love to win this before embarking on my next sweater project! I just bought a sweater quantity of yarn....what a great place to jump in! Every single review I have heard for this book has been nothing less than glowing. I keep saying that I need to stop buying knitting books because I have so many that I don't use, but I think I do need to add this one to my library! I would love to win. I need help choosing flattering patterns! I too would love to knit and wear most of the sweaters in the book!! Ooh, I'd love a copy! Looks like a great book. This looks like a great book! I'd love a chance to win a copy. 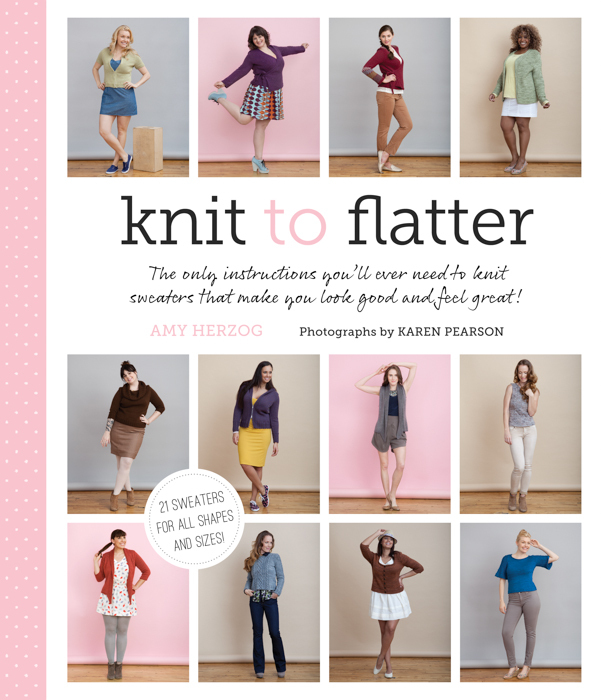 This looks like an invaluable book full of ways to make sure your knit fits just right! I would love to win this! I've been super-excited about sweater yarn recently, so having a book full of smart patterns about now would be awesome. That book looks fantastic! I'd love to own a copy. Thanks so much for the review and the giveaway! This book looks so great! ah- this book looks amazing! can't wait to get my hands on it soon. thanks for doing a give-away! This book sounds so interesting! I'd love to get some fitting-tips for my sweater knitting! This sounds like a must have book for any knitter. I am new at knitting sweaters, and would love to learn shaping.Thank you for the review and the chance to win. This book looks incredibly interesting - would love to own it. I just saw the pics and love it already! I have been following Amy's blog for some time now, and I'm really impressed with her patterns and her ideas about making flattering sweaters. I would LOVE to win this book and then I might find the courage to attempt my first sweater! Thanks for hosting the contest. I really want this book. I'd love to win it, but even if I don't I'll be buying it once my vacation is paid for! I'd really like to learn how to make modifications to sweaters I knit so that they are flattering and fit me better. Amy's book seems like just the ticket. Thanks for the chance to win! I'm ready to knit a sweater that fits. I would love this book. I love this book and how she makes it easy to actually knit a sweater that actually fits. Yay. I'd love to learn how to apply basic mods to any pattern, the way I do when sewing. It sounds as if this book will enable me to take out all my knitting books again - one after the other they've been relegated to a distant shelf and the sweaters I made from them frogged. It's a beautiful book! A great reference and lovely wearable patterns. This book looks amazing! I can't wait to read it! Oh wow this looks like an amazing book!!! I agree with you on the first cardigan. It's gorgeous!! And it doesnt hurt that the yarn is luscious! Please add me to the drawing! Oh, what lovelies! Thanks for the chance! Ooh, Stoker is lovely. And what a great reference book to have in your library! My favorite in the book (so far) is Stoker as well. For me, sweaters with a cowl are always most flattering. It shows a bit of skin and frames a pretty necklace. Always a win! I have always shied away from knitting sweaters, mostly because I'm terrified of making one that won't turn out right. I saw this book at Barnes and Noble earlier today, and think it's the perfect inspiration to get me started on my first sweater! I'd really love to win this book! :) Thanks for the giveaway. If I don't get lucky and win a copy somewhere, this is definitely a book to purchase. Our library has it and it is as wonderful as all the reviews are saying it is. I've been eying this book for months. I want to knit my first sweater this year, and this will be a great resource. I hope i win! Hope I'm not too late for the drawing! This looks like an awesome book! 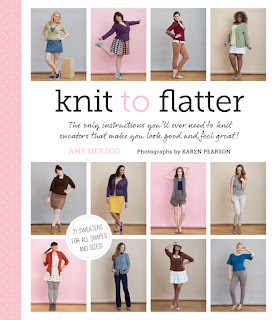 Count me in, I'm very intrigued by your description of Knit to Flatter!